The Simpsons and The Jetsons are two of the greatest American cartoons ever created. So it was exciting to see those two worlds collide in last night's new episode of The Simpsons. Too bad it was so uncomfortable. The whole thing plays out as you might expect, with Bart skipping school for a Spaceball game, Lisa playing her sax and heading to see the world's last tree, and Marge grabbing money from Homer's wallet in a direct nod to the original Jetsons series. The weird part? 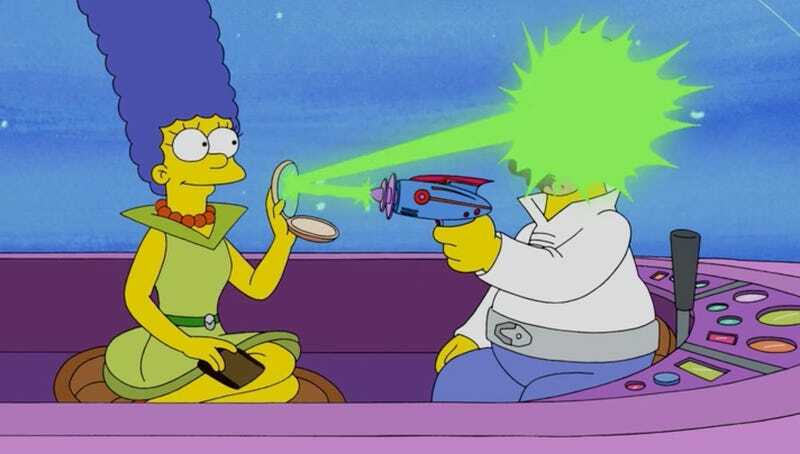 Homer pulls out a blaster gun and aims it at Marge. She then holds up a mirror, deflecting the blast and hitting Homer in the face. At best, the segment felt like a missed opportunity. At worst? It's a strange moment where Homer tries to physically harm Marge, which might arguably only be acceptable in the bizarro world of their annual Halloween-themed episodes, Treehouse of Horror. Of course, The Simpsons is far from the first show to poke fun at the Jetsons intro. The most famous parody is probably the Family Guy segment where George doesn't allow Jane to leave with the wallet. But this one feel particularly weak, maybe because I have higher standards for The Simpsons. It felt like an unnecessary and lazy bit on a show that has otherwise really rebounded in the past few years. I realize that I'm probably taking this whole thing way too seriously. It's just a cartoon. But taking trivial stuff seriously is literally my job. So what do you think? Was their take on the Jetsons intro too weird, simply not funny, or fantastic and I just don't have a sense of humor?